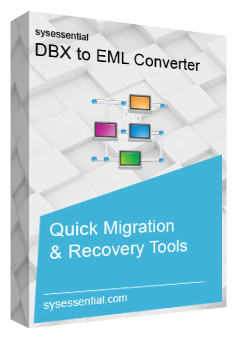 Extract unlimited DBX files into EML file format via professional software solution such as Sysessential for DBX to EML Converter application. This is an established application used widely for fulfilling email migration requirements to its fullest. Support all email clients supporting EML file format such as Windows Live Mail, Thunderbird etc. Freeware demo run show the way tool converts DBX emails into PST file format. This is the most efficient software solution to work with because it uses simple conversion techniques. An efficient to use application when it is to export every detail from DBX files of Outlook Express into EML. There is hardly any need to worry because this application is supportive of working with all the Windows versions such as Win 7, Vista, ME, NT, and so many more. If you are looking for availing all the details before making investment in the licensed edition of the software then simply call at the helpline number and avail all the info prior. Because of easy purchase formality, users hardly come across any issues while making payment of the tool. This is a well-known software application that supports running on the PC installed with any of the Outlook editions. Seek the software and without worrying about the specific editions of the tool, you can move ahead and migrate email data with ease. Sysessential for DBX to PST Converter is a perfect software tool when it is convert DBX emails onto PST file format. This application is supportive of all Outlook Express versions including 5, 5.5, 6 and so many more. You may consider using the application without considering the specific OE edition. Customer care team of Sysessential for DBX to PST Converter application provides latest updates of the tool time to time. This way users will catch the updates in an automated way and will be able to use added features in the software for availing best benefits. There is surety for carrying out smooth data export from one email application into another. Data swiftly moves from one email client into another. You will be able to read all the emails in a separate PST file or else save into existing PST file. The application offers easy user-interface. This will really help for those who possess lesser technical skills. Just connect with the software and simply move away all the emails from DBX file format into EML files. What are the steps that tool uses for migrating DBX files into PST? What are the MS® Windows OS editions software supports to work with? Is there any risk to data while email migration process? There is no data risk when it is to export emails. The tool involves zero risk while making a move from DBX into EML. The software developers use latest technologies and well-tested in the labs in order to check everything in the application. Is there any file size limit with the tool? Is software supportive of migrating corrupted DBX files too? Software converts only healthy DBX files into EML file format. It do not extract damaged DBX files. How free demo trial run helps? The freeware demonstration edition extracts first 10 emails from every DBX folder in EML file. Besides accessing export process, you will get idea how software user features. Thus for evaluation and investigation purpose, downloading application for free will help ahead. When I got the need of moving into email environment, I firstly worried about the emails stored in Outlook Express email application. I wanted to take away my DBX files from OE into EML file format of Windows Live Mail. The procedure that tool uses is simple and hassle-free which migrated all the emails into EML file. After migration process ends up, I am able to access emails successfully into EML file format. I had an amazing experience. The need was to migrate all the emails from Outlook Express into EML and for fulfilling the requirement; I want some reliable application to use. In this regard, I tried many software applications in free demo editions and then I clicked Sysessential for DBX to EML converter. The tool exported all the emails from DBX files without causing any hurdles like alterations in folder hierarchy in EML file format. Such a superb email migrator utility!